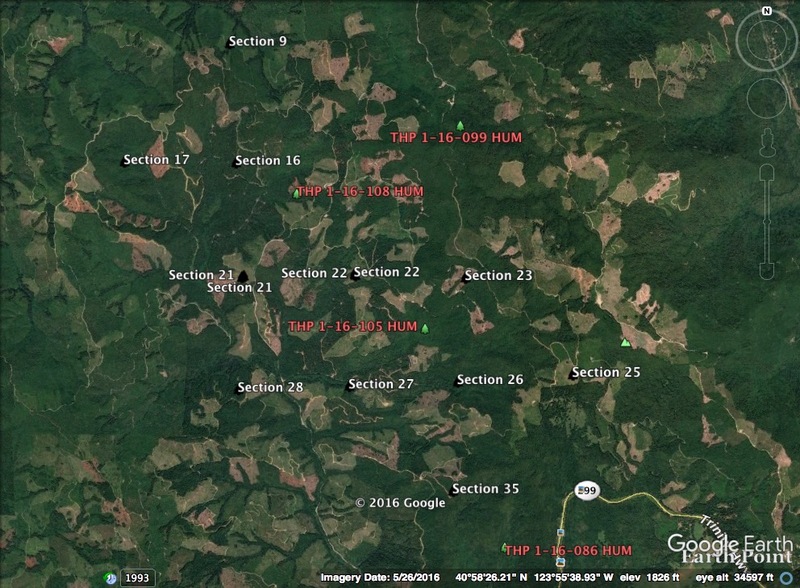 THPBlog: Green Diamond Resource Company planning a pair of clearcut THPs near the Highway 299 Coast Range Summit. Green Diamond Resource Company planning a pair of clearcut THPs near the Highway 299 Coast Range Summit. This THP is about 8 miles NE of Arcata, CA and a few miles NW of the Highway 299 Coast Range summit at an elevation of 1,500 to 2,000 feet. 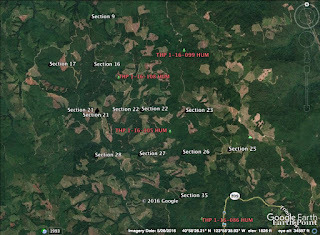 Green Diamond Resource Company is planning a mostly clearcut feller buncher, shovel and cable logging operation on steep and unstable slopes in redwood and Douglas fir forests. The THP area flows into the Mad River which is listed as an impaired watershed for sediment, temperature and turbidity. There are 3 landslide terrain sites including 2 shallow rapid landslides along the upper NW portion of unit G, a deep seated landslide within unit G, and 2 road failure sites including a cut bank failure along the K&K 100 road, and a vertical cut bank failure along the K&K 430 road. Green Diamond Resource Company is planning to re-construct 1,500 feet of existing steep seasonal road on a grade exceeding 15%. 16 road drainage sites are planned for work including rocking, dip construction, ditch cleaning and restoration of washed out crossings. A Cooper's hawk was spotted 300 feet east of unit B in 2010, Sonoma tree voles were reported inside units B and C during 2004 surveys, and southern torrent salamanders are known to occur in some of the class II (mid sized) habitat inside unit E. There are 4 spotted owl nesting territories within 1.3 miles of the THP area, including nesting territories within .25 mi of units E and G, and within .5 miles of unit D. This THP is just SE of Green Diamond Resource Company’s recently proposed Basin Central THP 1-16-108 HUM. This THP is about 8 miles NE of Arcata, CA and 3 miles NW of the Highway 299 Coast Range summit at an elevation of 760 to 1,680 feet. Green Diamond Resource Company is planning a mostly clearcut tractor and cable logging operation on steep and unstable slopes in redwood, western hemlock and Douglas fir forests. The THP area flows into the Mad River which is listed as an impaired watershed for sediment, temperature and turbidity. There are multiple cut bank and fill slope failures adjacent to unit B, a fill failure associated with a shallow rapid landslide on the K&K 626 Road, and an old depression in unit E. 12 road drainage sites are planned for work Including rocking, dip construction, ditch cleaning, culvert repair/replacement and restoration of washed out crossings. There is a historic peregrine falcon eyrie 1.3 miles west of the THP area, and 8 spotted owl nesting territories within 1.3 miles of the THP area including nesting territories within .25 mi of units E and F, and within .5 mi of unit A. This THP is just NW of Green Diamond Resource Company’s recently proposed Canyon Creek Scramble THP 1-16-105 HUM.